CHICAGO — September year-over-year drycleaning sales were higher, on average, across the country, according to the results of this month’s American Drycleaner StatShot survey. With the country divided into four regions, the West posted the largest gain for the month, 5.3%, when compared to sales for September 2014. Following closely was the South with a 5.1% increase. 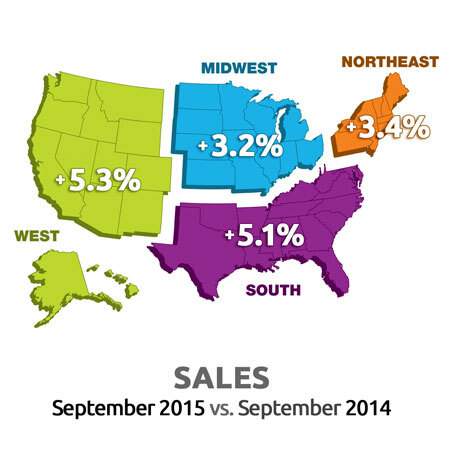 In the Northeast, September 2015 sales were 3.4% higher than those of September 2014. Year-over-year sales were up 3.2% in the Midwest. Third-quarter 2015 sales were also positive, on average, for all regions. The West posted the largest year-over-year gain for the period, 5.0%. Next were the Northeast (4.3%) and South (4.2%). The Midwest saw its quarterly sales rise by 2.5% compared to the same period in 2014.